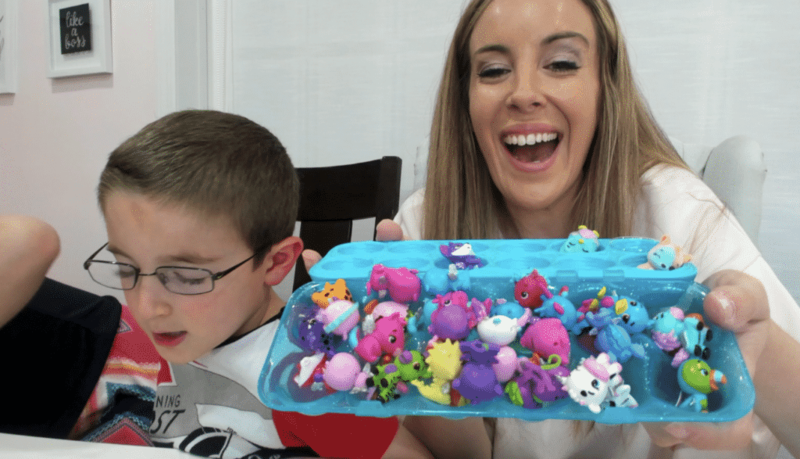 I got my hands on a variety of Hatchimals CollEGGtibles Season 2 toys and my family had a ton of fun unboxing them all. Here’s a full confession – I’ve never actually opened up one of the eggs before. So, I didn’t quite understand the process. Once I realized what you had to do, there was no stopping me! Caleb now has such a great collection. Wait until you see! Scroll to the bottom to see how you can get yours started today. For now, here’s the full YouTube video of our Hatchimals CollEGGtibles Season 2 unboxing. Talk about a blind toy unboxing! Tiny, adorable collEGGtibles that need your love to hatch. Every toy comes in a small speckled egg that you hold in your hand. How Do I Hatch The Egg? You see the purple heart? You have to rub the heart over and over again until it changes color. When it does, that means that it’s ready to hatch. Press down with your finger under the egg cracks. You can then discover what Hatchimals CollEGGtible is inside. Each one is a surprise!! How fun is that? Once your new friend has hatched, you can create a nest for your Hatchimal by peeling down the egg shell until you reach the wavy line. Super cute! Check off each Hatcimal you find off of your Collector’s list. And yes, there are RARE ones to find which makes it super fun! Trade with friends. Makes clubs! It’s such a wonderful hobby. FUN FACT: If your Hatchimal has glittery wings… then it’s RARE. We had so much fun learning about all the new designs that were included in Hatchimals CollEGGtibles Season 2! Each of my children enjoyed a different figure. Personally, that cow stole my heart – the very first one that I opened up. Loved it! The kids love to do toy reviews because they get to play with everything once we are done. I love to do toy reviews because I get to show moms what works for families. These are such a great pick because the whole family can get involved. Be sure to visit Hatchimals for more information. 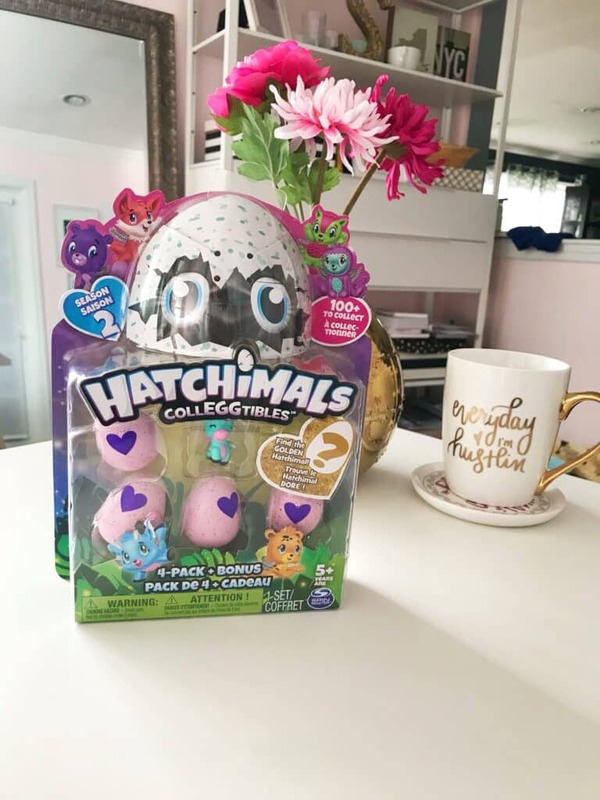 Time For The Hatchimals CollEGGtibles Season 2 Giveaway! To enter this contest, use the form below. 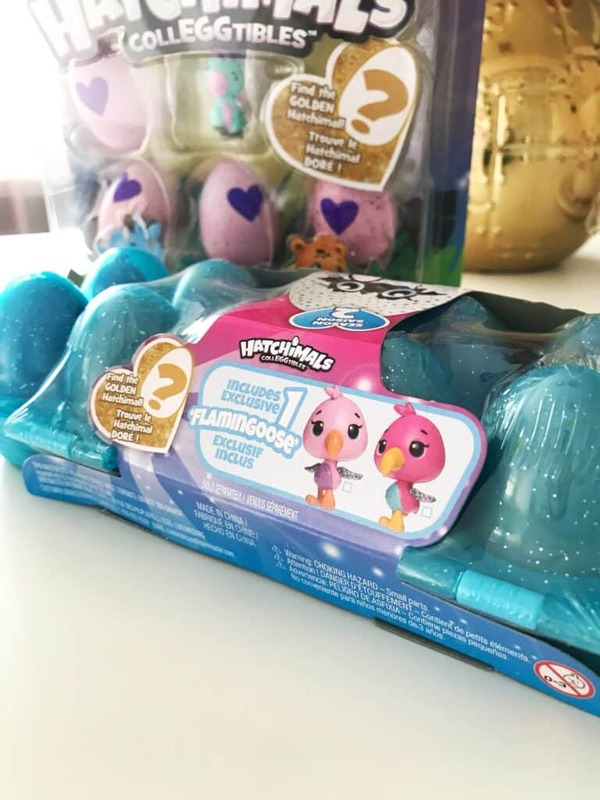 You are entering to win a Hatchimals CollEGGtibles Season 2 4 pack + bonus AND a Hatchimals CollEGGtibles Season 2 dozen carton. Both of these items are featured in the above photo. US resident only. Must be 18 years or older. This contest is in no way affiliated with Hatchimals. Hatchimals gifted these products to me for a review. OMG! Hatchimals are such an awesome toy! So much engagement! Cracking shells! Love the unboxing! My daughter loves the surprise aspect of it. I love that these are so cute and each one if different. I also love the happy squeal my granddaughter makes over each one as she opens them. My Granddaughter likes the anticipation of what is inside each egg. I like how cute they are and the variety to play with. I love the experience of opening them. It’s a fun and cute surprise! I just love that my daughter loves them! Other than that I don’t know too much about them. Thanks so much for the chance! My niece loves Hatchimals. She loves the surprise. And the little ones are great for collecting. I like that Hatchimals are animal themed and the surprise aspect. I Love how they interact, and also the fact that they hatch out of an egg. That you don’t know what your going to get in each egg. The element of surprise is what makes it fun. I love everything about them the element of surprise, each toy is mega cute. Collecting them & displaying them with my daughters is so much fun! They are so cute! The kids love them! We love the varieties available and trying to figure out what type of animal each Hatchimal is! (Not as easy as it sounds in some cases!). I love the fact that you have to “hatch” the egg and discover what you get inside! This would be a great win to get to Hatch a Hatchimal! My niece loves them because she loves getting suprise toys and the ‘suspense’ of not knowing which one she will get. The anticipation of what is going to hatch. I love that my children love Hatchimals….and not just for a few minutes! 🙂 Thank you. They are great gifts for kids. I like the colors, the Hatchimals are super cute and great gifts for all ages. I love them because they are adorable! I like that they are cute and unique. Myy granddaughters would love these. Innovative and educational toy that will entertain at any age. I honestly love that with my kids it teaches patience and as they say patience is a virtue. I also love to watch the excitement everytime they think it’s going to Hatch. Great gift to give your child or grandchildren. I lovr the bright colors and the suspense of waiting to see what hatches. I love their bright colors and the suspense of waiting to see what hatches. Watching the hatchimal go through different life stages. I love that they would keep my kids entertained for hours! They are very cute and it’s fun to wait and see what hatches. I love that you can “hatch” them yourself! I love that there are so many different ones, and that my niece likes them! We don’t have any but I love the surprise factor. I love that you don’t know what it is until it hatches! I like how cute they are. My daughter has a bunch of them and they are so adorable. I love the surpirse factor and they’re adorable! I do not love anything about them however a dear friends daughter who LOVES them is the one who these would go to . That would win me friend of the year there and her mom of the year! I love that you never know what you’re gonna get. They’re cute toys for kids. I wish they had had them when I was growing up. I love that they are always a surprise and my son loves them! I think they are cute and I love that they hatch. My kids would love that they hatch so cute and fun too. I think Hatchimals are adorable! I was just playing with them with my daughter yesterday aand I was thinking how much I would have loved them when I was a little girl. I love that they hatch! I love the surprise element and the colors. My kids love these. The surprise is the best part of these!! I love collectibles, how cute! I love that my step daughter loves them and gets so excited about them. The excitement waiting for the surprise inside! I like that they communicate with each other. My granddaughters trade theirs so they learn new words. I like that they are entertaining and a fun surprise. Hatchimals keep my daughter entertained for hours! I like the surprise of Hatchimals! I love the variety of the hatchimals! I love how much joy the Hatchimals has brought to the kids in my family. Seeing them laugh and smiles is priceless. We love that its a fun suprise to see what we get! I love that my daughter loves them. My daughters love cracking them open to see which is inside! I love that my kids have so much fun with them. I love all the cute characters and how fun they are for my daughter! i love that the kids really love them. they are super cute. These would be so much fun for my niece. She would enjoy seeing the different ones that are inside. I love how colorful and cute they are! Thanks for the chance to win! We love the surprise factor of hatchimals, you never know what you will get. I like that each one has a cute and fun personality. My daughter loves opening them to see which ones she got! The hatching and the surprise. They are just so adorbs! I love how cute they are and how many different kinds there are. So many different little animals to collect! The suspense and the cuteness is what I love about Hatchimals! My daughter loves to tell me about each of them because they are all different! My favorite thing about hat him also is the fun of finding out what is inside. What I love about Hatchimals is their cuteness and that they fit in egg cartons. Thanks for the giveaway! My granddaughter loves the surprise. I love the surprise and I love how cute they all are! I’ve never seen an ugly one! I like that my they make my grand daughter happy. I think they’re adorable and my niece loves them. I love that some rare Hatchimals have glittery wings.